I've always been a swimmer, but I got into marathon swimming in 2006 when I completed my first 8-mile Boston Light Swim, an event I now co-direct. Since catching the marathon swimming bug, I've been lucky to have had the opportunity to tackle some of the most beautiful and challenging cold waterways in the world, from the English Channel and Loch Ness to Lake Tahoe, Lake Memphremagog, the Catalina Channel and around Manhattan Island. Check out the highlights below or click on my swimming resume for all the chilly details. On August 22, 2015, Sarah Thomas, Craig Lenning, and I set out together from Fort Augustus at the southern end of Loch Ness shortly before 6 a.m. to each swim solo to the far side of the loch. The cold air and lack of sunshine did nothing to offset the chilling, 51- to 54-degree water that greeted us upon entry to this deep, dark, and forbidding lake. Nevertheless, after an exceedingly challenging journey, we all finished. After 13 hours, 21 minutes and 22.2 miles, I clambered up on an empty, shingle beach at Lochend. This was the second of the three swims that make up the "Triple Crown of Lake Monster Swims" and the hardest swim I've completed to date. I swam the English Channel on a gorgeous, early August day in 2009. I started from Samphire Hoe a little after 8 a.m. and arrived at a dark and desolate Wissant beach shortly before 11 p.m. that day, completing the iconic 21-mile swim in an exceedingly average 13 hours 55 minutes. Although my time places me smack dab in the "middling" section for speed these days, back in 1955 when Florence Chadwick set the new speed record for crossing "The Ditch" she did it in 13:55. I'm in great company, and it was an amazing day! 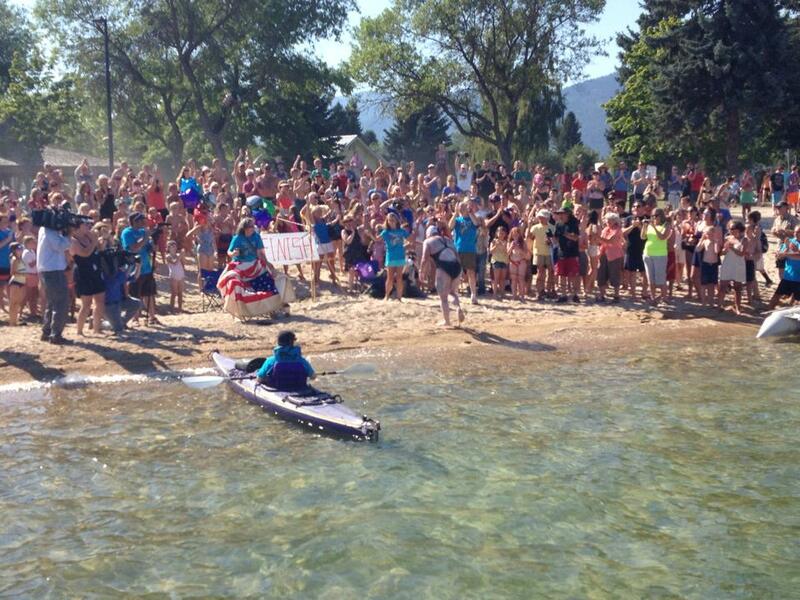 In July 2014, I became the first person to swim the 32.3-mile length of Lake Pend Oreille in northern Idaho. It was an incredible challenge and a beautiful journey, made sweeter by the amazing support I had along the way from local people in Sandpoint and from my crew that looked after me during an intense night and day of swimming. Arriving at Sandpoint City Beach sometime after 4 p.m. to a crowd of 200-some people after spending 20 hours and 25 minutes in the water was a real mind-bender. Marathon swimmers are accustomed to toiling in the cold and dark in obscurity, so to have a throng of people waiting to greet me was completely unexpected and akin to seeing a mythical creature. Lake Pend Oreille has one of those, too-- Paddler--who some say was invented by the U.S. Navy to cover up their activities testing nuclear submarines after World War II in America's fifth deepest lake. The talented documentary film maker Scott Rulander captured my 2014 swim in Lake Pend Oreille.